In 1840, the flag of the East India Company fluttered over the Writers’ Building, the British gentry came to the Townhall in horse drawn carriages to attend concerts and Calcutta was among the frontline cities of the world, where fortune seekers and entrepreneurs, artists and artisans, men of letters and men with a vision came with great expectations in their heart. David Wilson was one such visionary entrepreneur who set up a bakery in a lane opposite the Government House, the residence of George Eden, the 1st Earl of Auckland and the Governor General of India. Serving the best quality bread and English breakfast, the bakery soon earned a distinction as the “Bread basket of the East”. It became a new meeting place for the glitterati of the city. 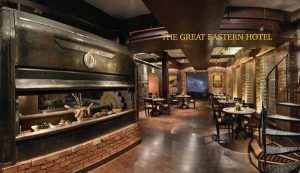 The long story of The Great Eastern Hotel is also the story of the rising and falling fortunes of Calcutta. As Calcutta grew to be the ‘first city of the East’, the jewel in the crown of the British Empire, the Auckland Hotel expanded. More wings were added. The managing company changed its name from D. Wilson and Co. to Great Eastern Hotel Wine and General Purveying Co. The hotel was rechristened ‘The Great Eastern Hotel’ on the 10th of September, 1865. An Indian, a writer called Peary Chand Mitter, joined the board of directors and the hotel was electrified. As the chandeliers bearing electric bulbs spread their aura in the hotel lobby, many guests of importance walked in. Writers like Rudyard Kipling and Mark Twain have left their remarks on the hotel on the pages of the books, merchants have clinched business deals under the arches of this hotel and even Mahatma Gandhi took hospitality of this hotel in 1896. By then, the founder David Wilson had passed away, leaving behind a legacy that far outlived him. After Wilson’s demise, the hotel was run by a team of English, French and Indian owners. After India’s independence, the ownership of the hotel came in the hands of a group of Parsee and Bengali families. These were the years when many heads of state and political leaders visited Calcutta. The Great Eastern Hotel extended its hospitality to Nikita Krushchev, Nikolai Bulganin, Ho Chi Minh and then to Queen Elizabeth II in 1961. 1970s was a trying decade for West Bengal. The Naxalite Movement, the Bangladesh Liberation War followed by the influx of refugees, the trade union movements resulting in the closure of industry took their toll on Calcutta. There was unemployment and a population explosion. The city that was once the jewel in the crown of the Empire, lost its sheen and patronage. A luxury hotel like The Great Eastern began to look like an anachronism in a city where people were struggling to keep their head above water. The decline of the hotel began during the Naxalite era in West Bengal and continued into the 1970s. In 1975, the Government of West Bengal under the then Chief Minister, Mr. Siddhartha Shankar Ray took over the management of the hotel, which was on the brink of closure. In 1977, the Left Front Government came to power and the management of the hotel passed into their hands. 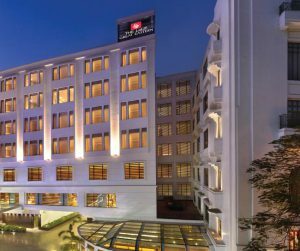 The Lalit Suri Hospitality Group bought over the hotel from the West Bengal Government in 2005. It took them seven years to renovate the hotel. The Lalit Great Eastern Hotel became operational once again on the 1st of February, 2014. 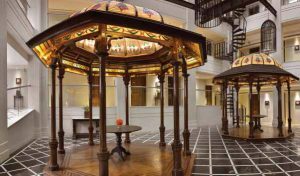 The renovated hotel is an amalgamation of three different eras of history. The Heritage Block 1 is steeped in the Victorian Era. The Heritage Block 2 flaunts the Edwardian Era and the New Block is true to the contemporary era. ‘It was a challenge to restore a 175 year old structure that was built in different phases using different building material and different technology’, says Mr. Rakesh Mitra, the General Manager of the hotel, “The Victorian era construction has no concrete, no steel, no mortar. The Bengal tiles in the thick walls are plastered with only lime and ‘surki’. And the walls stand exactly the way they did 175 years ago.” The Edwardian block constructed in the early 20th Century has a steel structure. All the iron beams came from UK. The building, contemporary with the Howrah Bridge, was constructed on vertical and horizontal steel trusses, riveted together. Since there is no welding, there is no chance of rusting and corrosion. “The biggest challenge to restoration was internally connecting the blocks, in keeping with the requirements of the modern hotel industry,” says Mitra. The interiors of the hotel are adorned with the artifacts of yesteryear. The brass irons, whose bellies were once filled with smouldering charcoal, are now receptacles for plants. So are the baked mud bread moulds from the erstwhile Wilson’s Bakery. The seven dough kneaders of the bakery are currently working as ‘planters in the corridors and lobbies of the hotel’. Tasting the Christmas goodies and other products at the Great Eastern Bakery adjacent to the hotel is an experience in itself. Taking a bite into the plum cake and washing it down with a cup of rich hot chocolate served with marshmallows and freshly whipped cream, is guaranteed to be a heavenly experience that will linger in one’s taste buds and in one’s memory for a long time to come. 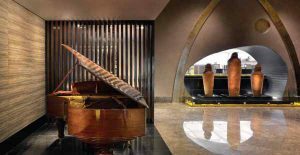 As you soak in the lilting melody being played on the piano and step out of the hotel into the busy thoroughfare of Esplanade East, you become aware of the heritage that has given a backdrop to your identity.